Location: Celestial Hall of Time. Pixelmon Reforged is booted and ready for playing, grab version 6.2.3! We have just come back up with a new and clean map. Mining: Get paid to mine in our refilling mine area, farm on the top level and more! Pixelmon: Hunt for special pokemon and get rewarded for it! Train a whole team or fill your pc with every pokemon you can find. There are gyms to find and battle all over the map, including 8 custom cities with 8 special badges which are run by players and npcs for ease. Houses: Purchase houses in towns using a door and signs system with lockette! With full craftbook enabled! Craftbook 4: Craftbook 4 is a server enhancing plugin that adds new physics and mechanics. With no extra mods needed! Dynmap: Get to know where you are on the map and others using Dynmap! PvP Arenas: Find arenas in towns where players can PvP for each others loot! Buy enchanted items on the Universal Market! Economy: Use a variety of economy bending plugins to attain wealth on the server! Auctions, a Universal Market and /sell and /buy. Pixelmon Drop goods to sell to villagers all over the map. Special to justiscraft is justiscrafts.com Exchange System, a websided economy using rcon and player vaults! 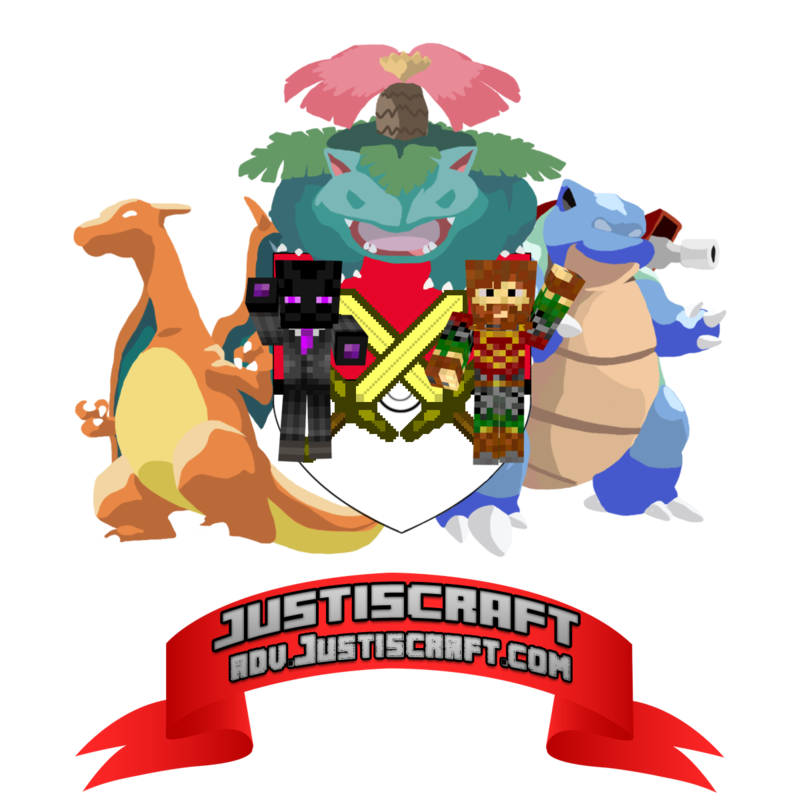 Signup on justiscrafts.com for a free 10000 reserves to be spent on ingame items such as masterballs and rare candy! Casino: Gamble with your hard earned cash! Win big or just get your money back, players can make their own slot machines in their houses for a fee of $5000! Leave a reply with this questionnaire filled out and we will read it as soon as possible! Look for the answer in this thread! Gym Leader is pretty straight forward. You signup for the one you want to head or ask for an open one. When someone needs the Gym you rush over to it and proceed to battle them. Gym Leaders get a title suffix and some extra perms to make the job worth while. When someone needs help you rush over and proceed to help them. Last edited by Vikerus on 21 Mar 2018 13:50, edited 86 times in total. - 04 Nov 2014 18:10 #140214 I can vouch for this server's quality. Map is large and immensive, community is friendly and accessible as well as quick and ready staff. You all should join now! - 08 Nov 2014 17:17 #140518 We are in the middle of adding quests. It should be pretty fun here in a month or so once we have a good list for people to complete. Our forum has also been updated and is fancier then ever, we need people to re-register though! Last edited by Vikerus on 24 Jan 2015 07:59, edited 1 time in total. - 01 Dec 2014 16:29 #142191 After a week or so of a hiatus I am back! The jc forum looks great with bootstrap customized by yours truly . I'm working on the website and hope to have a rewarding point system and social mod integrated with the site before 2015. - 29 Dec 2014 14:17 #143709 Hello and Happy Holidays everyone! Don't let this topic fool you we are active as ever and looking to meet new faces! The social site has one hiccup still. Messages are to be encrypted and decrypted in realtime but at the moment I am stuck at decrypting the messages with the private key. - 21 Jan 2015 15:05 #144941 Justiscraft as many know is always looking to add or improve something. And today I would like to announce two new large additions to JC! First is BREEDING! We have come up with a novel way for adventure players to breed pokemon. It involves buying a breeders license ingame and then using our patented "breeding farms." You can breed for perfect IV pokemon to your hearts content! Second is GLOBAL MARKET! After a long process of testing the global market plugin in Strongblox our survival server, we've decided to add it to Justiscraft. Now players have the option of putting up bulk or special items for sale to the entire player base without making broadcasts! If you're new to the mod, our server or an old timer. Please stop by and give the server a go. You really won't be disappointed! Special: Leave a comment below with your thoughts on the server, good or bad. And we will reward you with a JC point. Please leave your IGN though so we can identify you ingame. Thanks! Amperes City is under way. Again... It's going to be better then anything yet! Pictures I'll throw up tomorrow. There is also BIG NEWs, Justiscraft is bringing survival back due to popular demand! Look for the thread when we release! We've also added GTS and MobArena to the server! - 24 Jan 2015 23:06 #145268 Sup guys. Ignore this vik. 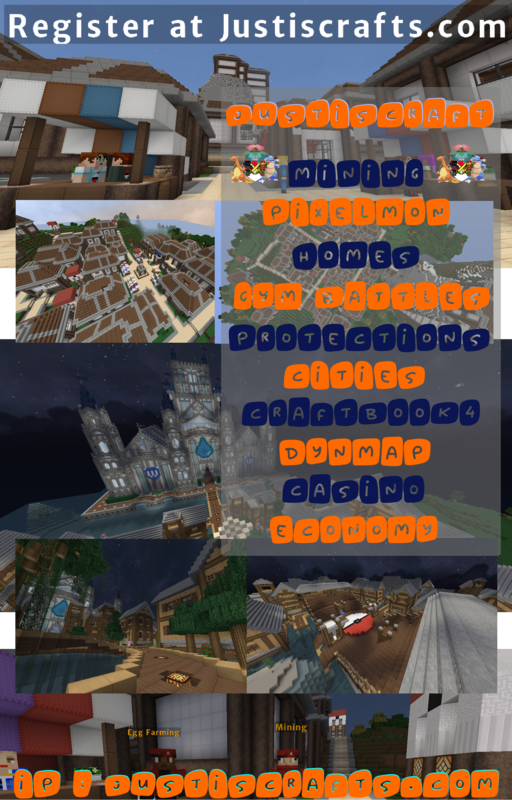 I've been playing on this server for quite some time and I must say that this community is very nice , very helpful and very dedicated to its players. I suggest you give this server a try and you won't be dissapointed :>. Last edited by FastAcela150 on 04 Apr 2015 14:31, edited 1 time in total.